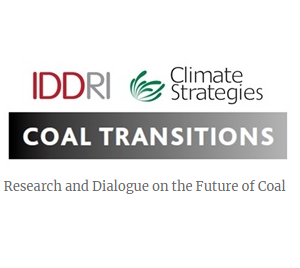 We are running a new project with Paris-based think tank IDDRI: ‘Coal Transitions: Research and Dialogue on the Future of Coal‘. Coal Transitions is a KR Foundation funded, two-year transdisciplinary, international effort to link and reinforce policy, research and advocacy efforts on coal transition in different countries. The project aims to fill the gap of international dialogue and lesson learning on coal transition, but will also link to other initiatives focusing on coal, such as on the investor side. Coal Transitions’ international coverage includes Australia, China, Germany, India, Poland and South Africa. For more information, please download a two page briefing on this page. You can also follow updates on the Coal Transitions website and Twitter page.